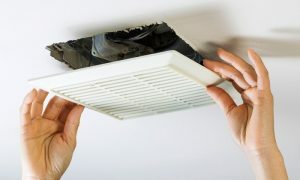 Air duct systems are breading grounds for germs, dust, allergens and other airborne irritants when they go uncleaned. In order to clean, heat and condition the air, a ventilation system pulls air from the interior rooms. Thus, this process collects airborne particles which line the interior walls of the air ducts with a combination of dust, dust mites, pet dander, allergens, pollutants, bacteria, mold and mildew. As these pollutants accumulate over time, this debris will flow back out into your home’s circulating air. For a homeowner concerned about their home’s cleanliness, the quality of the air should be paramount. Bad air quality is the result of filthy air vents and may have a harmful effect on family and pets health and well being. 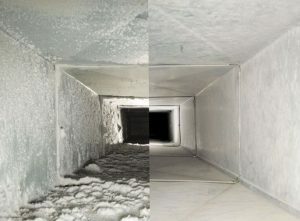 The reason for dryer ducts and air vents being so susceptible to debris buildup is because the moist air carries airborne fabric fibers which get past the lint screen and into the vent. The fibers build up against the vent’s walls as the dryer’s air dries and over time will clog the line unless cleaned out, which also lower the power and efficiency of your dryer. To make matters more perilous, a clogged vent is a fire hazard as the hot, trapped air only gets hotter and this accumulated lint his highly flammable. Echo Carpet Cleaning will provide a deep and thorough vacuuming of the air ducts and dryer vents resulting in complete removal of all the debris along the air duct and vent walls. Call Echo Carpet Cleaning to improve the air quality of your home or business by cleaning your air ducts and dryer vents.